With fiscal cliffs and end-of-days fears clouding the end of 2012 and even the start of the new year, it’s sometimes hard to get an optimistic view of the future. But for two Utah institutions dedicated to teaching about the natural world, 2013 is going to be all about the idea that bigger and better days are still to come. Utah’s Hogle Zoo already opened one successful new expansion in 2012, its Rocky Shores exhibit. 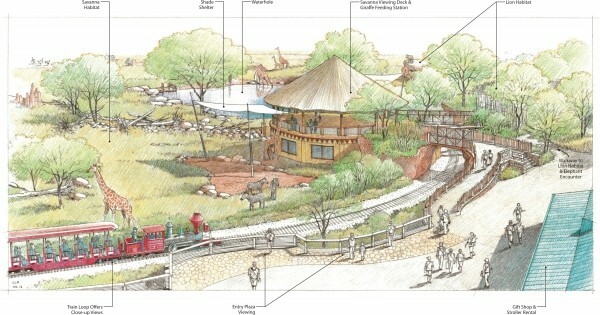 For much of 2013, the focus will be on completing the final part of a five-year master plan as a five-acre African Savanna is constructed at the main entrance. The exhibit, scheduled for a spring 2014 opening, will bring lions back to the facility, add a giraffe feeding station and feature many other yet-to-be-determined species. The Living Planet Aquarium, meanwhile, is undertaking its own even more ambitious expansion. October 2012 marked the groundbreaking for the new Loveland Living Planet Aquarium in Draper, a 136,000-square-foot building that will more than triple the exhibit space at the current Sandy location, include more outreach classrooms, and allow rotating exhibits and attractions such as a 40-foot walk-through “undersea” tunnel. Doors are slated to open in December 2013. While an economic downturn might seem like an unlikely time to take such steps, the plans have long been under way. The zoo’s renovations are part of the 2008 Renew the Zoo $33 million bond that also required $11 million in private fundraising. The aquarium’s Sandy location, a former retail building, has always been considered temporary, and a combination of a $14 million Draper city bond (scheduled to be repaid by the aquarium over 20 years) and private donations finally led to its new location. Both institutions have faced unique planning challenges based on their locations—both in terms of being in Utah, and in terms of the facilities’ specific location within the Salt Lake Valley. According to Angie Hyde, marketing director for The Living Planet Aquarium, the space constraints of the current 43,000-square-foot Sandy location have led to crowded exhibits on the busiest days, and overflow from the parking lot to a neighboring (and generously accommodating) grocery store across the street. Additionally, the facility has had to face the reality that it might never be able to house certain aquatic species—most notably one that’s most frequently inquired-about: dolphins. Because of specific requirements for the number of dolphins that can be housed together, a minimum of four animals would have to be purchased at the same time—a prohibitive cost for the aquarium. For both The Living Planet Aquarium and Hogle Zoo, meeting the goal of creating places that are most attractive to visitors and staff—as well as good for the animals—is the focus of the current upgrades. But as with all upgrades, there will be some minor inconveniences along the way. Construction at the zoo is requiring the closure of the Zoofari train until the completion of the African Savanna, while some animals from Woodland Edge and Discoveryland will be temporarily relocated. The aquarium, meanwhile, will be closing the Sandy location after Labor Day 2013 to allow the animals to be moved to the new location; pass holders will have their expiration dates extended for the duration of the closure.